Laundry is always a chore, and it never ends, am I right? So how would you like a few goodies to make it a little less of a torture? Enter to win every day through March 31, 2015! You read that right. A new washer and dryer. Intrigued? Enter HERE. 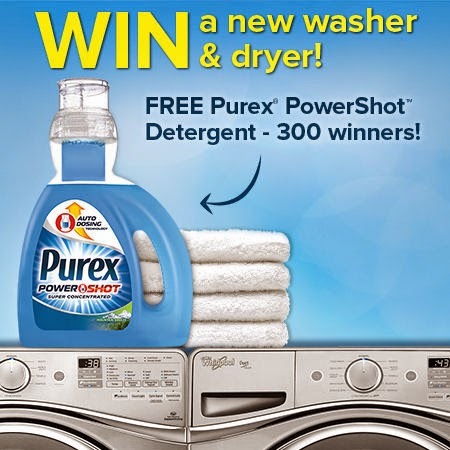 To celebrate the release of the NEW Purex® PowerShot™ detergent, Purex will be hosting an amazing giveaway! Share & enter the sweepstakes & get a $1 off coupon. Gotta love detergent coupons, eh? Three grand prize winners get a Whirlpool washer & dryer set. 300 second-place winners will receive a bottle of Purex® PowerShot™ detergent. What's PowerShot? It does the measuring for you. Check out the video HERE!